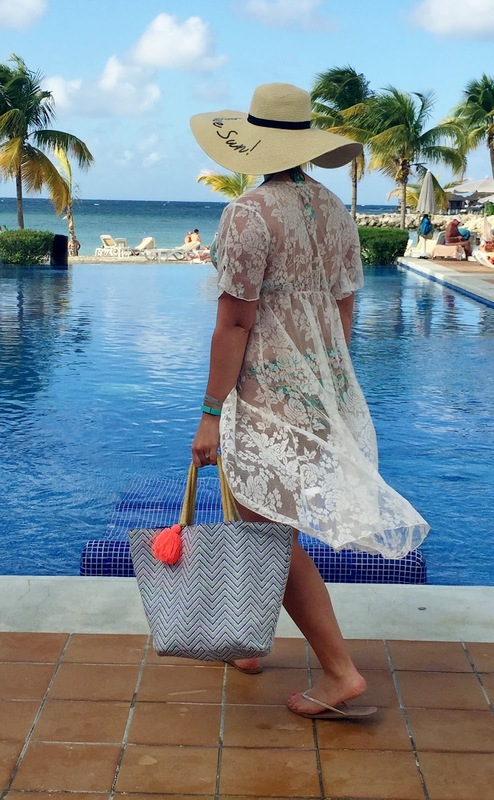 The ultimate vacation wear is definitely the swimsuit! 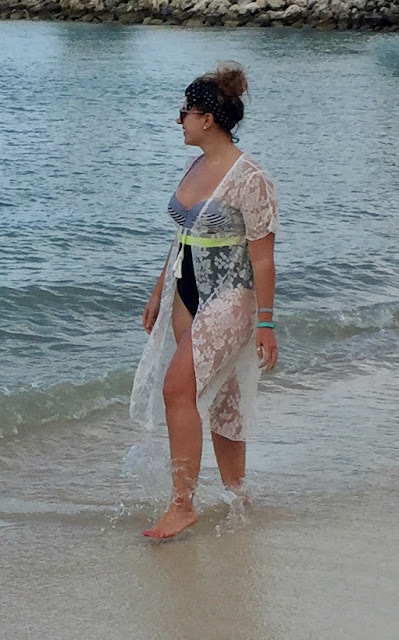 I've gathered all of my beach/pool side looks in one massive post. I've broken things up by swimsuit, that way the widgets are more specific to a certain style and in turn make your shopping experience more straightforward. Let's dive-in, shall we? First up I have the black triangle bikini with gold print. I've had this suit for a number of years now and had ordered it from Venus. They have a great selection of swimsuits and their size charts are very useful for ordering online. I also find they fit well because the sizes are similar to bra sizing, which simplifies things greatly! I paired it with my current favourite lace cover-up. Add simple stud earrings and braided hair to complete the look. The second swimsuit is probably my all-time favourite! Being a huge colour fan, I could not resist this whimsical one-piece. The deep plunging neckline and the funky straps also add interest to the suit. Wanting to keep the it the statement piece, I paired it with a solid-coloured sarong. 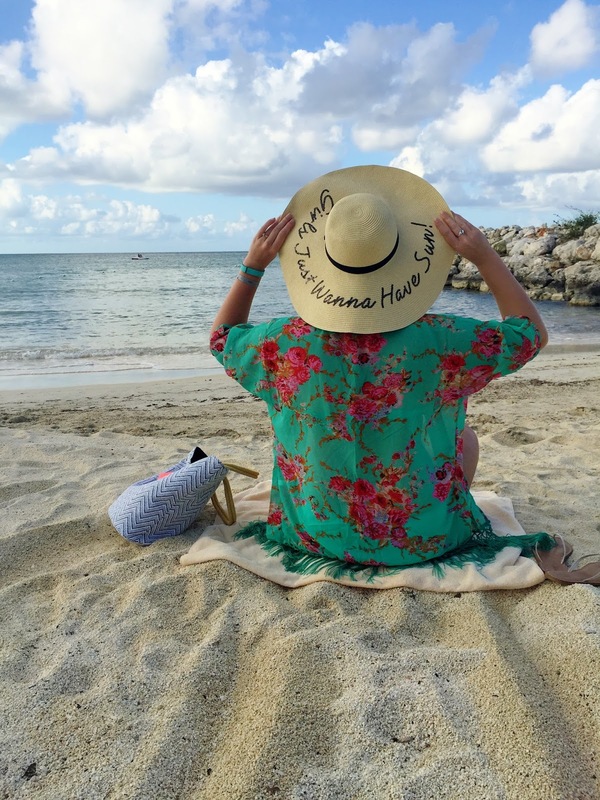 Throw on a panama hat for that effortless leaning-on-a-palm tree look! Like the bold look? Be sure to check out the Trina Turk brand. She always has really fun, might I say daring, swimwear options. Third is this classic, vintage-y one-piece from Old Navy. I really love the colour-blocking with a pop of colour and bustier neckline. To me, this screams 60s siren. I actually amped up the vibe with a bold red lip and tied a handkerchief scarf around my head. The lace cover-up makes another appearance and the look was as classic as can be. The bold, cat-eye sunnies help bring the whole look to life! Next up is my turquoise bikini. I'm a huge fan of bandeau-style bikini tops and those from La Vie en Rose are hard to beat! They have boning on the sides so they stay up, they are lightly padded, so not see-through, and they have the optional straps should you want more support. Seriously, there is nothing not to love about those. I also love how practically their entire collection is mix and match. 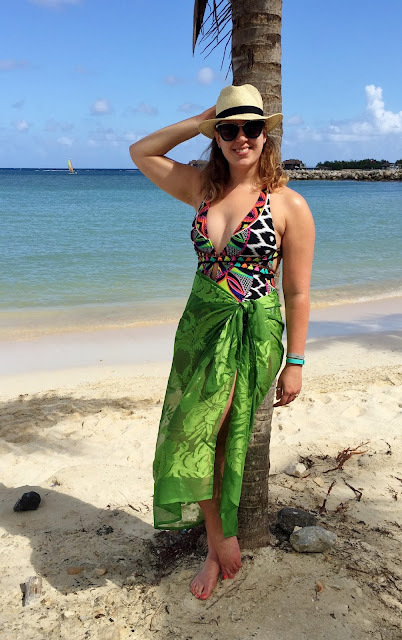 I am different sizes on the top and bottom, so having the flexibility to pick different sizes and styles makes swimsuit shopping a breeze. Because the company is first and foremost a lingerie store, I find their products to be well built and really made for women. A lot of thought goes into the designs of these suits and LVER is typically my first stop for swimsuits. 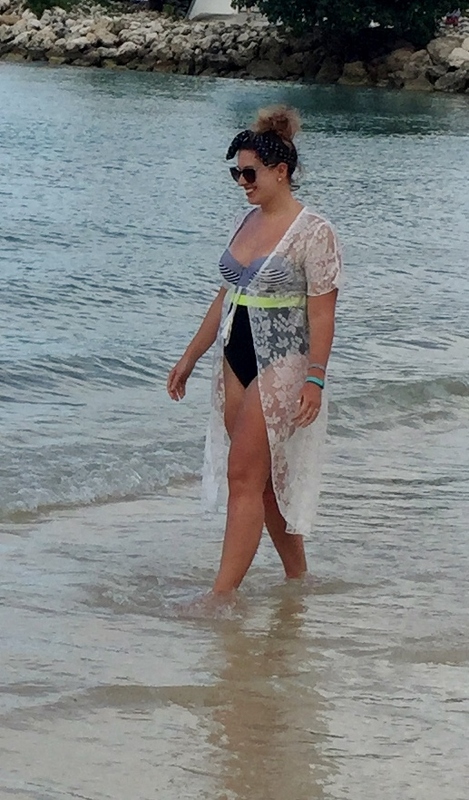 I paired it with a turquoise cover-up that I recently got on Amazon to bring along on this trip. Once it came in, I realized the shade was not a perfect match, but it was not big enough of a difference to stop me from wearing them together. Big floppy hats are also a thing of mine... I really like this one I got last summer. Girls really do just want to have sun on vacation! I replenished my vitamin D and am ready to power-through the rest of winter! My final pool-side look was this tropical-palette print bikini. The orange, teal and gold accents really pop against sun-kissed skin. This one is also from La Vie en Rose and I love it! The style is a different bandeau top and the straps are actually convertible to halter. You simply tie them around your neck or around your back for the different looks. I reached for the lace cover-up and the floppy hat once more. Hey, this is real life and I do actually wear this stuff on repeat. When you get items you love, you really don't mind wearing them over and over again! I also carried around this straw tote with me all week. It was my beach bag and fared well in the sand and wet pool decks. I snagged it from Old Navy last spring and find it to be the perfect bag to bring on vacation as it is light and packs flat in a suitcase. I'm hoping they come out with more this summer! So there you have it, a week's worth of beachy looks! Now, the countdown to spring is on!